Most eCommerce shopping software has Featured Products functionality to highlight certain products on your homepage. This function is also available at PrestaShop. Here is the instructions on how to set up. 2. On the Information tab, scroll down to the Catalog section. 4. Scroll down and click Save. 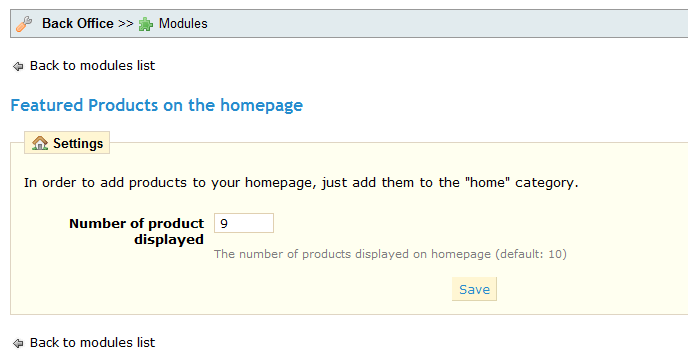 The item will now display in the Featured Products section of your Front Office homepage. 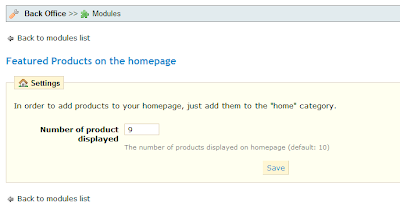 Note:To remove a Featured Product from the shop homepage, unmark (tick off) the Home check box in the Catalog section of its admin Product Page. 3. Change the number and click "Save"